The Dvorak technique (developed between 1969 and 1984 by Vernon Dvorak) is a widely used system to estimate tropical cyclone intensity (which includes tropical depression, tropical storm, and hurricane/typhoon/intense tropical cyclone intensities) based solely on visible and infrared satellite images. Within the Dvorak satellite strength estimate for tropical cyclones, there are several visual patterns that a cyclone may take on which define the upper and lower bounds on its intensity. The primary patterns used are curved band pattern (T1.0-T4.5), shear pattern (T1.5–T3.5), central dense overcast (CDO) pattern (T2.5–T5.0), central cold cover (CCC) pattern, banding eye pattern (T4.0–T4.5), and eye pattern (T4.5–T8.0). Both the central dense overcast and embedded eye pattern use the size of the CDO. The CDO pattern intensities start at T2.5, equivalent to minimal tropical storm intensity (40 mph, 65 km/h). The shape of the central dense overcast is also considered. The eye pattern utilizes the coldness of the cloud tops within the surrounding mass of thunderstorms and contrasts it with the temperature within the eye itself. The larger the temperature difference is, the stronger the tropical cyclone. Once a pattern is identified, the storm features (such as length and curvature of banding features) are further analyzed to arrive at a particular T-number. The CCC pattern indicates little development is occurring, despite the cold cloud tops associated with the quickly evolving feature. Several agencies issue Dvorak intensity numbers for tropical cyclones and their precursors, including the National Hurricane Center's Tropical Analysis and Forecast Branch (TAFB), the NOAA/NESDIS Satellite Analysis Branch (SAB), and the Joint Typhoon Warning Center at the Naval Meteorology and Oceanography Command in Pearl Harbor, Hawaii. The initial development of this technique occurred in 1969 by Vernon Dvorak, using satellite pictures of tropical cyclones within the northwest Pacific Ocean. The system as it was initially conceived involved pattern matching of cloud features with a development and decay model. As the technique matured through the 1970s and 1980s, measurement of cloud features became dominant in defining tropical cyclone intensity and central pressure of the tropical cyclone's low-pressure area. Use of infrared satellite imagery led to a more objective assessment of the strength of tropical cyclones with eyes, using the cloud top temperatures within the eyewall and contrasting them with the warm temperatures within the eye itself. Constraints on short term intensity change are used less frequently than they were back in the 1970s and 1980s. The central pressures assigned to tropical cyclones have required modification, as the original estimates were 5–10 hPa (0.15–0.29 inHg) too low in the Atlantic and up to 20 hPa (0.59 inHg) too high in the northwest Pacific. This led to the development of a separate wind-pressure relationship for the northwest Pacific, devised by Atkinson and Holliday in 1975, then modified in 1977. As human analysts using the technique lead to subjective biases, efforts have been made to make more objective estimates using computer programs, which have been aided by higher-resolution satellite imagery and more powerful computers. Since tropical cyclone satellite patterns can fluctuate over time, automated techniques use a six-hour averaging period to lead to more reliable intensity estimates. Development of the objective Dvorak technique began in 1998, which performed best with tropical cyclones that had eyes (of hurricane or typhoon strength). It still required a manual center placement, keeping some subjectivity within the process. By 2004, an advanced objective Dvorak technique was developed which utilized banding features for systems below hurricane intensity and to objectively determine the tropical cyclone's center. A central pressure bias was uncovered in 2004 relating to the slope of the tropopause and cloud top temperatures which change with latitude that helped improve central pressure estimates within the objective technique. Note: The pressures shown for the NW Pacific basin are lower as the pressure of the entire basin are relatively lower than that of the Atlantic basin. Values of 8.1–8.5 are only assigned by the CIMSS and NOAA automated advanced Dvorak systems and not used in subjective analyses. In a developing cyclone, the technique takes advantage of the fact that cyclones of similar intensity tend to have certain characteristic features, and as they strengthen, they tend to change in appearance in a predictable manner. The structure and organization of the tropical cyclone are tracked over 24 hours to determine if the storm has weakened, maintained its intensity, or strengthened. Various central cloud and banding features are compared with templates that show typical storm patterns and their associated intensity. If infrared satellite imagery is available for a cyclone with a visible eye pattern, then the technique utilizes the difference between the temperature of the warm eye and the surrounding cold cloud tops to determine intensity (colder cloud tops generally indicate a more intense storm). In each case a "T-number" (an abbreviation for Tropical Number) and a Current Intensity (CI) value are assigned to the storm. These measurements range between 1 (minimum intensity) and 8 (maximum intensity). The T-number and CI value are the same except for weakening storms, in which case the CI is higher. For weakening systems, the CI is held as the tropical cyclone intensity for 12 hours, though research from the National Hurricane Center indicates that six hours is more reasonable. The table at right shows the approximate surface wind speed and sea level pressure that corresponds to a given T-number. The amount a tropical cyclone can change in strength per 24‑hour period is limited to 2.5 T-numbers per day. Within the Dvorak satellite strength estimate for tropical cyclones, there are several visual patterns that a cyclone may take on which define the upper and lower bounds on its intensity. The primary patterns used are curved band pattern (T1.0-T4.5), shear pattern (T1.5-T3.5), central dense overcast (CDO) pattern (T2.5-T5.0), banding eye pattern (T4.0-T4.5), eye pattern (T4.5 – T8.0), and central cold cover (CCC) pattern. Both the central dense overcast and embedded eye pattern utilize the size of the CDO. The CDO pattern intensities start at T2.5, equivalent to minimal tropical storm intensity (40 miles per hour (64 km/h)). The shape of the central dense overcast is also considered. The farther the center is tucked into the CDO, the stronger it is deemed. Tropical cyclones with maximum sustained winds between 65 miles per hour (105 km/h) and 100 miles per hour (160 km/h) can have their center of circulations obscured by cloudiness within visible and infrared satellite imagery, which makes diagnosis of their intensity a challenge. The CCC pattern, with its large and quickly developing mass of thick cirrus clouds spreading out from an area of convection near a tropical cyclone center within a short time frame, indicates little development. When it develops, rainbands and cloud lines around the tropical cyclone weaken and the thick cloud shield obscures the circulation center. While it resembles a CDO pattern, it is rarely seen. The eye pattern utilizes the coldness of the cloud tops within the surrounding mass of thunderstorms and contrasts it with the temperature within the eye itself. The larger the temperature difference is, the stronger the tropical cyclone. Winds within tropical cyclones can also be estimated by tracking features within the CDO using rapid scan geostationary satellite imagery, whose pictures are taken minutes apart rather than every half-hour. Once a pattern is identified, the storm features (such as length and curvature of banding features) are further analyzed to arrive at a particular T-number. Several agencies issue Dvorak intensity numbers for tropical cyclones and their precursors. These include the National Hurricane Center's Tropical Analysis and Forecast Branch (TAFB), the National Oceanic and Atmospheric Administration's Satellite Analysis Branch (SAB), and the Joint Typhoon Warning Center at the Naval Pacific Meteorology and Oceanography Center in Pearl Harbor, Hawaii. BOTH TAFB AND SAB CAME IN WITH A DVORAK SATELLITE INTENSITY ESTIMATE OF T2.5/35 KT. HOWEVER ...OFTENTIMES THE SURFACE WIND FIELD OF LARGE DEVELOPING LOW PRESSURE SYSTEMS LIKE THIS ONE WILL LAG ABOUT 12 HOURS BEHIND THE SATELLITE SIGNATURE. THEREFORE... THE INITIAL INTENSITY HAS ONLY BEEN INCREASED TO 30 KT. Note that in this case the Dvorak T-number (in this case T2.5) was simply used as a guide but other factors determined how the NHC decided to set the system's intensity. The Cooperative Institute for Meteorological Satellite Studies (CIMSS) at the University of Wisconsin–Madison has developed the Objective Dvorak Technique (ODT). This is a modified version of the Dvorak technique which uses computer algorithms rather than subjective human interpretation to arrive at a CI number. This is generally not implemented for tropical depressions or weak tropical storms. The China Meteorological Agency (CMA) is expected to start using the standard 1984 version of Dvorak in the near future. The Indian Meteorological Department (IMD) prefers using visible satellite imagery over infrared imagery due to a perceived high bias in estimates derived from infrared imagery during the early morning hours of convective maximum. The Japan Meteorological Agency (JMA) uses the infrared version of Dvorak over the visible imagery version. Hong Kong Observatory and JMA continue to utilize Dvorak after tropical cyclone landfall. Various centers hold on to the maximum current intensity for 6–12 hours, though this rule is broken when rapid weakening is obvious. Citizen science site Cyclone Center uses a modified version of the Dvorak technique to categorize post-1970 tropical weather. The most significant benefit of the use of the technique is that it has provided a more complete history of tropical cyclone intensity in areas where aircraft reconnaissance is neither possible nor routinely available. Intensity estimates of maximum sustained wind are currently within 5 miles per hour (8.0 km/h) of what aircraft are able to measure half of the time, though the assignment of intensity of systems with strengths between moderate tropical-storm force (60 miles per hour (97 km/h)) and weak hurricane- or typhoon-force (100 miles per hour (160 km/h)) is the least certain. Its overall precision has not always been true, as refinements in the technique led to intensity changes between 1972 and 1977 of up to 20 miles per hour (32 km/h). The method is internally consistent in that it constrains rapid increases or decreases in tropical cyclone intensity. Some tropical cyclones fluctuate in strength more than the 2.5 T numbers per day limit allowed by the rule, which can work to the technique's disadvantage and has led to occasional abandonment of the constraints since the 1980s. Systems with small eyes near the limb, or edge, of a satellite image can be biased too weakly using the technique, which can be resolved through use of polar-orbiting satellite imagery. Subtropical cyclone intensity cannot be determined using Dvorak, which led to the development of the Hebert-Poteat technique in 1975. Cyclones undergoing extratropical transition, losing their thunderstorm activity, see their intensities underestimated using the Dvorak technique. This led to the development of the Miller and Lander extratropical transition technique which can be used under these circumstances. ^ a b c d Velden, Christopher; Bruce Harper; Frank Wells; John L. Beven II; Ray Zehr; Timothy Olander; Max Mayfield; Charles “Chip” Guard; Mark Lander; Roger Edson; Lixion Avila; Andrew Burton; Mike Turk; Akihiro Kikuchi; Adam Christian; Philippe Caroff & Paul McCrone (September 2006). 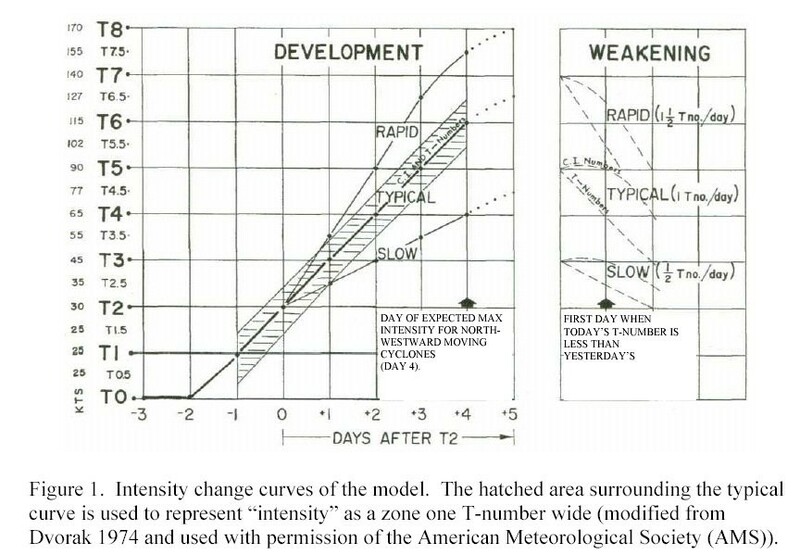 "The Dvorak Tropical Cyclone Intensity Estimation Technique: A Satellite-Based Method That Has Endured For Over 30 Years" (PDF). Bulletin of the American Meteorological Society. 87: 1195–1214. Bibcode:2006BAMS...87.1195V. doi:10.1175/bams-87-9-1195. Retrieved 2012-09-26. ^ Satellite and Information Service Division (April 17, 2005). "Dvorak Current Intensity Chart". National Oceanic and Atmospheric Administration. Retrieved 2006-06-12. ^ a b Landsea, Chris (2006). "Subject: H1) What is the Dvorak technique and how is it used?". Hurricane Research Division. Retrieved 2012-09-09. ^ Timothy L. Olander; Christopher S. Velden (February 2015). ADT – Advanced Dvorak Technique Users' Guide (McIDAS Version 8.2.1) (PDF). Cooperative Institute for Meteorological Satellite Studies (Report). University of Wisconsin–Madison. p. 49. Retrieved October 29, 2015. ^ Naval Research Laboratory. "Tropical Cyclone Forecasters Reference Guide". United States Navy. Retrieved 2006-05-29. ^ Leffler, J.W. "T-Number Curve Comparison between JTWC and JMA". Archived from the original on 2006-07-25. ^ National Oceanic and Atmospheric Administration Satellite and Information Service (2011-08-26). "The Dvorak Technique Explained". National Oceanic and Atmospheric Administration. Retrieved 2006-05-29. ^ a b Burton, Andrew; Christopher Velden (2011-04-16). "Proceedings of the International Workshop on Satellite Analysis of Tropical Cyclones Report No. TCP-52" (PDF). World Meteorological Organization. pp. 3–4. Retrieved 2012-11-23. ^ a b c Velden, Christopher; Timothy L. Olander & Raymond M. Zehr (March 1998). "Development of an Objective Scheme to Estimate Tropical Cyclone Intensity from Digital Geostationary Satellite Infrared Imagery". Weather and Forecasting. University of Wisconsin. 13: 172–186. Bibcode:1998WtFor..13..172V. doi:10.1175/1520-0434(1998)013<0172:DOAOST>2.0.CO;2. Retrieved 2012-09-09. ^ a b Lander, Mark A. (January 1999). "Pictures of the Month: A Tropical Cyclone With an Enormous Central Cold Cover". Monthly Weather Review. American Meteorological Society. 127: 132–134. Bibcode:1999MWRv..127..132L. doi:10.1175/1520-0493(1999)127<0132:atcwae>2.0.co;2. ^ a b Dvorak, Vernon F. (February 1973). "A Technique For the Analysis and Forecasting of Tropical Cyclone Intensities From Satellite Pictures". National Oceanic and Atmospheric Administration: 5–8. ^ Wimmers, Anthony; Chistopher Velden (2012). "Advances in Objective Tropical Cyclone Center Fixing Using Multispectral Satellite Imagery". American Meteorological Society. Retrieved 2012-08-12. ^ Rogers, Edward; R. Cecil Gentry; William Shenk & Vincent Oliver (May 1979). "The Benefits of Using Short-Interval Satellite Images To Derive Winds For Tropical Cyclones". Monthly Weather Review. American Meteorological Society. 107: 575–584. Bibcode:1979MWRv..107..575R. doi:10.1175/1520-0493(1979)107<0575:tbousi>2.0.co;2. ^ De Maria, Mark (1999-04-19). "Satellite Application is Tropical Weather Forecasting". Archived from the original on 2006-08-13. Retrieved 2006-05-29. ^ Stewart, Stacy (2005-10-16). "NHC Tropical Depression 24 Discussion Number 3". National Hurricane Center. Retrieved 2006-05-29. ^ "Cyclone Center". www.cyclonecenter.org. Retrieved 2015-08-05. Wikimedia Commons has media related to Dvorak technique.